Another real plus about being at the Grandparents is that they bought the babies single strollers since there is always someone extra to push a baby. 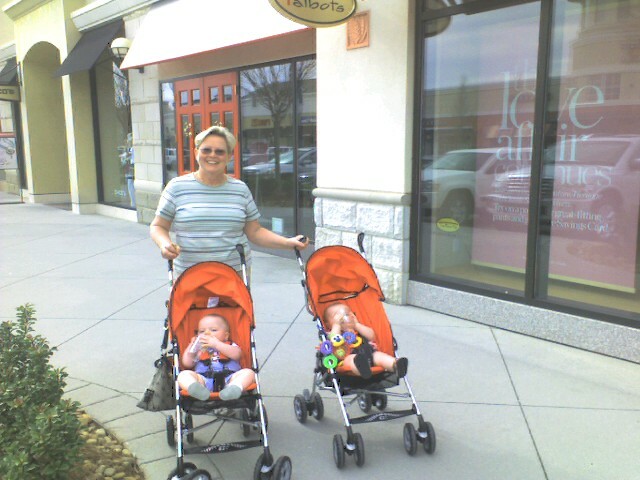 I am now so spoiled after pushing these strollers around. The boys loved them, as long as you kept pushing. They also loved shopping and chewing on empty Panera cups. Who knew that a plastic cup would be so entertaining!!! Sorry for the poor quality picture. We took the twins shopping one day and here they were being perfect little ones at lunch. I was shocked to say the least. They are in love with Baby Einstein so as soon as we got our food we turned on the DVD player...LOVE IT!!! So cute...and TN orange, gotta love it!